It’s the end of an era: T.G.I. 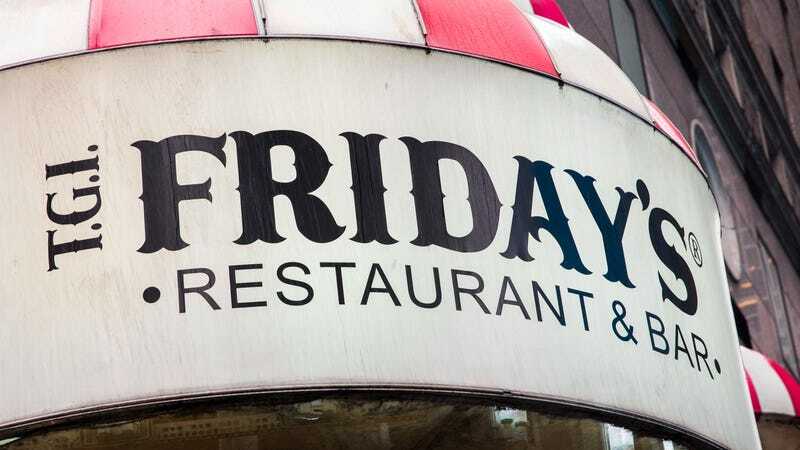 Friday’s is beginning to chuck its antique/junktique/faketique aesthetic for a cleaner, modern look (that evokes an IHOP). They’re not alone: Ruby Tuesday decluttered and upscaled in 2007. It’s all incredibly ironic, considering the popularity of “Brooklyn” style reclaimed wood, pseudo early industrial or faux-Gilded Age touches, and of course, farmhouse/country chic in the vein of Fixer Upper. It’s the same thing! Eventually, the singles moved on, and T.G.I. Friday’s and its offspring—Ruby Tuesday, Bennigan’s, Chili’s, Applebee’s—got their more family-friendly rep.
It’s a hell of a note that casual dining establishments are shucking their nostalgic look, with its roots in a late 60s/early 70s late Victorian/Gilded Age saloon pastiche that proliferated through the 80s—picture the opening of the TV show Cheers—even as the faux historical reclaimed wood craze continues to replicate wildly across the country. “Brooklyn” style, “farmhouse,” “Edison bulb chic,” whatever you want to call it, it’s all the same thing, and it’s basically the 2010s equivalent of Ruby Tuesday. A simulacrum carefully constructed not for historical accuracy but for a kind of sameness that doesn’t quite register yet as sameness. Not until the next new thing comes along. Artisanal donuts are delicious, though, don’t get me wrong.